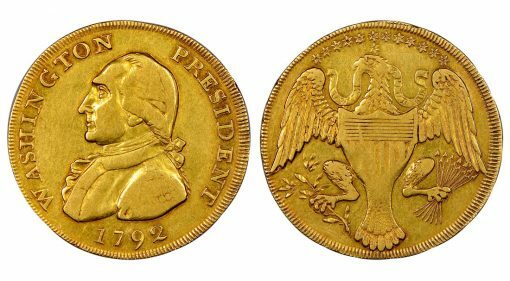 This is the first time the 1792 $10 Washington President gold eagle pattern coin appeared at public auction since 1890; 100 percent of the net proceeds will benefit charitable causes. Despite his vast collection, Newman considered the 1792 Washington gold eagle, graded NGC XF 45★, his favorite coin of all for a special reason. Newman believed the Washington gold eagle was not produced because legend stated it defied the president’s own edict that his likeness not appear on any U.S. currency to avoid appearing as a monarch to the new democracy. "To my father, George Washington was a personal heroes," son Andy Newman said. "He considered Washington’s refusal that our country’s first coinage depict his own image on it to be an emblematic example of Washington’s profound humility and willingness to put country before self." The article linked here is interesting, because there were a lot of Washington tokens issued in Britain around this time (see “The Red Book” for a whole section). Whether it was an actual pattern from the US Mint may be debatable, but it certainly is an interesting piece. Washington apparently did refuse to be on the coinage–no actual person appeared until the commemorative Columbian half of 1892–so who knows?